Background: Salicinoids (a type of phenolic glycoside) are plant secondary metabolites with chemical structures based on salicyl alcohol conjugated to b-D-glucopyranose, with demonstrated antiherbivore activity. These compounds have been purified and quantified in a variety of contexts. Validation of published methods is often incomplete, and there is no broadly-applicable reference procedure. Objective: To develop and validate a robust, versatile procedure for purification and quantification of salicinoids in salicaceous plants. Method: We extracted salicinoids from dried, ground Populus foliage into methanol:water, and purified them by sequential liquid-liquid extraction, flash chromatography and preparative scale HPLC. 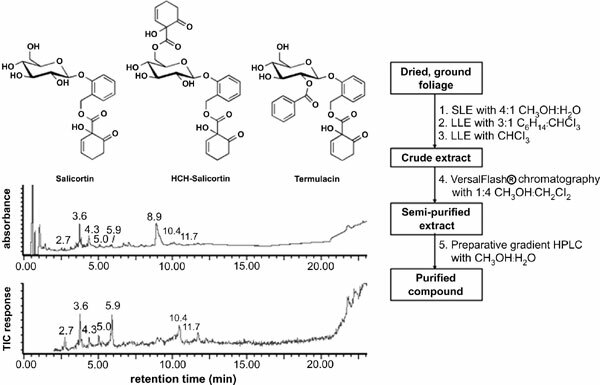 To evaluate potential source material for purification of salicinoids, we quantified salicortin, hydroxycyclohexen- on-oyl salicortin (HCH-salicortin), and tremulacin in methanolic extracts of Populus tremuloides, P. fremontii, and P. deltoides using ultra-high performance liquid chromatography (UHPLC) with diode array (DAD) and negative electrospray ionization single quadrupole mass spectrometry (MS) detection. Results: Recovery efficiencies and purities of salicinoids extracted from Populus ranged from 6-63% and 58->99%, respectively. Both detectors provided accurate quantification of salicinoids; MS was 100× more sensitive than DAD, permitting detection of plant tissue salicinoid concentrations ≥0.0006% dry weight. Conclusion: By consolidating and refining existing methods, we developed a reliable, versatile, and more environmentally-friendly procedure for purification and quantification of salicinoids. Flash chromatography, HPLC, phenolic glycoside, poplar, Populus, salicinoid.